The ice cream makers are giving New Englanders some warmer options this winter. By Jacqueline Cain·	 11/29/2016, 10:07 a.m. While the greater Porter Square neighborhood surrounding Honeycomb Creamery’s new ice cream shop has been very welcoming, cofounder Kristen Rummel understands the customers who have asked for something warm when they step inside. “People come in, they’re like, ‘We’re not really in the mood for ice cream, but we want to buy something, just because we want to keep you in business,’ which is awesome to hear,” she says. So, she’s happy to introduce Belgian liège-style waffles this week, with more warm drinks and baked goods on the way. Since Honeycomb Creamery launched last fall with scoops and pints at area farmers markets, Rummel and partner Rory Halnon have offered homemade waffle cones alongside their small-batch ice creams. Rummel has always wanted to incorporate warm, fluffy waffles, too, but didn’t have the space (or health regulators’ permission). “To me, the best part about ice cream is you can put it on a bunch of things—pies, waffles, cookies,” she says. Liège waffles—a rich, handheld, European street food go-to—have been gaining popularity since Zinneken’s Waffles opened in Cambridge and launched a popular food truck. 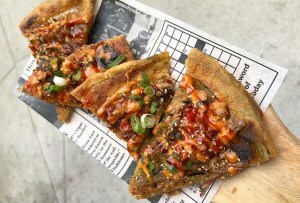 Cambridge is the epicenter: Curio Coffee debuted with the treat late last year, and the brand new Longfellows Coffee, which operates out of Lamplighter Brewing Co., is slinging them, too. In September, Honeycomb moved into a 1,000-square foot ice cream shop with a kitchen, where the duo has moved their production of mix-ins and cones. Most all of the baked goods will be made on site—though Rummel, a Union Square Donuts alum, still sources apple cider doughnuts from her former employers for that seasonal ice cream flavor. 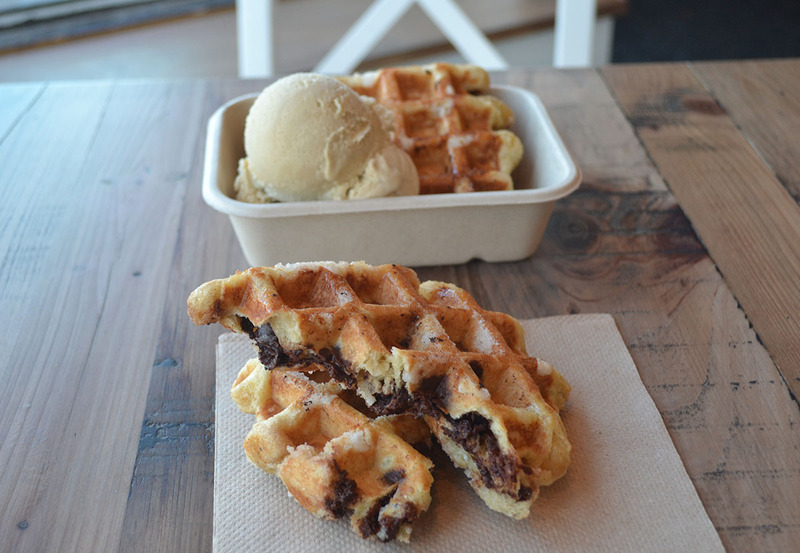 To start, Honeycomb will launch two flavors of Belgian waffles this Friday, vanilla and chocolate-filled. When fruit and berries come back into season in the spring, expect fruit-filled waffles, too, Rummel says. In the coming weeks, Honeycomb will introduce handpies filled with jam made from Kimball Fruit Farm berries that Rummel preserved after this year’s season, and she plans to expand the bakery program with cookies and more. Sound like a spread that needs a cup of coffee to go along with it? Honeycomb will start offering pour-overs and hot chocolate, too. Honeycomb Creamery, 1702 Massachusetts Ave., Cambridge, 617-714-3983, honeycombcreamery.com.